Mahim - Bandra Pipeline, India submitted to the assignment ‘Future Cities’ on National Geographic. Kristian Bertel has contributed to the National Geographic Your Shot photo community with an assignment called ‘Future Cities‘. It is Monica C. Concoran who are curating this assignment about the future cities. Did you know that by 2050 about seventy-five percent of the population will live in cities? As urban communities grow, cities will need to find new ways to become smarter. How are the cities we live in managing vital resources like energy, water, food and what kinds of smart innovations are preparing them to meet future challenges. The assignment is to show National Geographic a glimpse of your future cities and the innovative solutions that are helping them thrive. Whether it’s the city where you live or one you are visiting, capture an image of smart thinking that you believe will help the city grow more sustainably. This is the final assignment launched in conjunction with The Great Energy Challenge, a National Geographic initiative in partnership with Shell. The assignments and partnership as a whole are designed to make us stop and think about the role of energy in our lives In return for the sponsor’s support of this assignment, National Geographic may provide images from the assignment to the Shell for its use on its website, social media platforms, and other places to promote and publicize the assignment. So the assignment is much about the way we live in the world and ideas are being implemented in cities today that will change the way we live tomorrow. Cities are creating public green spaces that absorb heavy rains to prevent flooding. Utilizing electric public transportation reduces traffic and emissions and solar power panels installed atop buildings help meet increasing energy demands. If you think of yourself as an urban innovator, you can even share your own creative idea to make city living better in the future. What will the cities of tomorrow look like? Some say that we today have enough water to meet our needs, just what we need to do is just to become more water efficient. But what about the future, as the population on earth is growing? Depleting ground water table and deteriorating ground water quality are threatening the sustainability of both urban and rural water supply in many parts of India. The supply of cities that depend on surface water is threatened by pollution. Drinking water supply and sanitation in India continue to be inadequate, despite longstanding efforts by the various levels of government and communities at improving coverage. The level of investment in water and sanitation, albeit low by international standards, has increased in size during the last fifteen years. Humans are social creatures and thrive in urban spaces that foster social connections. Because of this, a shift to more dense, urban living would provide an outlet for social interaction and conditions under which humans can prosper. Contrary to common belief, urban systems can be more environmentally sustainable than rural or suburban living. With people and resource located so close to one another it is possible to save energy and resources things such as food transportation and mass transit systems. Finally, cities benefit the economy by locating human capital in one relatively small geographic area where ideas can be generated. In short we need to innovate water saving technologies.The photographer chose to participate with a photograph from Mumbai in India, where a man is walking on a giant water pipeline. 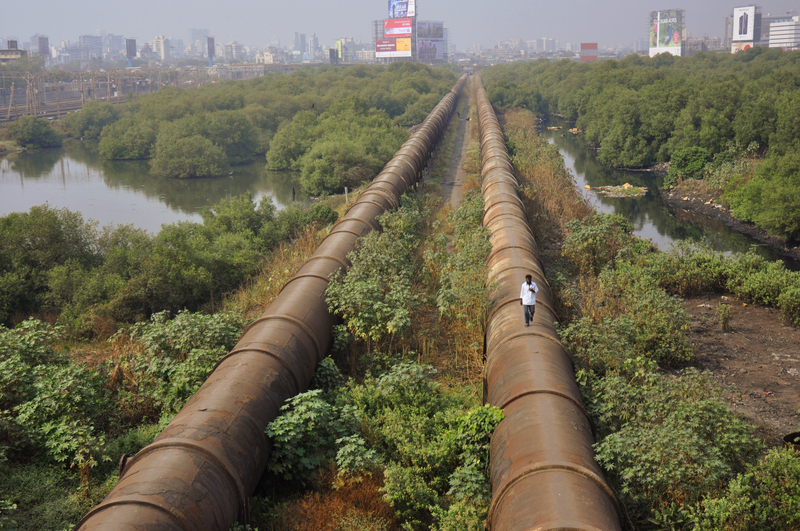 The Mahim - Bandra water pipeline runs parallel to the western railway line over the mangroves and Mithi river. This pipeline plays a vital role in water distribution system for the mega city as the water flows from this pipeline to the Pali Hill reservoir from where it is distributed to the surrounding areas and suburbs. This particular stretch of the pipeline is a photographic moment that are closely a symbol of Dharavi, which has been seen in the film Slumdog Millionaire. The photographer had been covering the life of people residing in the surrounding slums, when he was also photographing the water pipeline. ”– It is a giant water pipeline that runs along one of Dharavi’s rubbish-filled canals in Mumbai, India. As Mumbai’s population grows, the demand on the city’s existing infrastructure increases exponentially, and their water supply is finding it difficult to keep up. We have good regulations for saving energy, but we have nearly nothing for saving water. In the future, there is no need for a sewer, because we can deal with water in a more decentralized way. In that way we can maybe make high quality drinking water from rainwater, the rest of the water we can recycle several times, with the price of treated water, and the energy needed to pump it rising, cities are looking to any way they can cut the amount of wasted water. If we can treat dirty water in small systems like rooftops and riverbanks rather than big centralized water treatment facilities makes more sense as cities to continue to grow and energy prices remain uncertain ”, the photographer Kristian Bertel says.